Transform ordinary deviled eggs into a festive Holiday appetizer with a few simple steps. These Christmas Tree Deviled Eggs are sure to stand out as an adorable and delicious appetizer perfect for any Christmas Party. Deviled eggs are a traditional appetizer perfect for all Holidays. 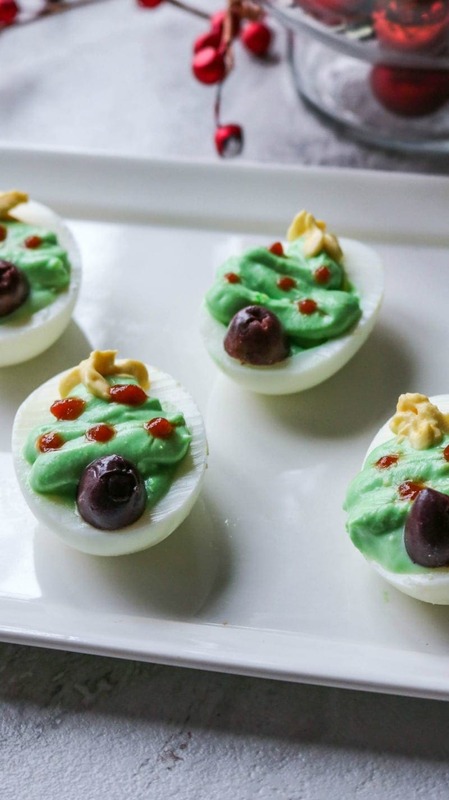 But when you dress up deviled eggs to resemble Christmas Trees, you are left with an appetizer that will impress anyone! These savory deviled eggs are an impressive appetizer to bring to any holiday party. And while these deviled eggs look hard to make, they are really quite easy! What I love, and what you are going to love, about these Christmas tree deviled eggs is their flavor and the fact that my standard for wholesome ingredients has not been compromised. 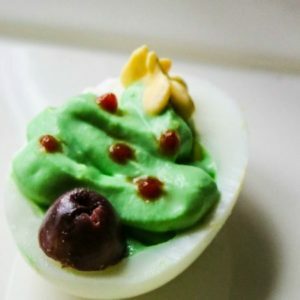 I used 100% natural food coloring to achieve my bright green Christmas tree–my family appreciated that I didn’t play around with adding spinach or pesto to my deviled egg filling, as I originally intended–but pesto deviled eggs do sound quite tasty to me! 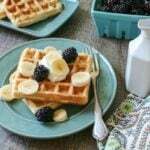 But this food coloring is a great way to have some fun without adding chemicals to your food. Hands down, I prefer using my Instant Pot Hard Boiled Eggs, as it is the BEST way to hard boil eggs. If you don’t have a pressure cooker, hard boil your eggs on the stove-top. Place eggs in a saucepan and cover with water. Add a teaspoon of baking soda (my mom taught me this helps with peeling the shells and I seem to think it does). Bring to a rapid boil and then cover the pan with a lid. Turn OFF the heat, and set the timer for 12 minutes. After the 12 minutes has passed, place eggs in cold water to stop the cooking process. 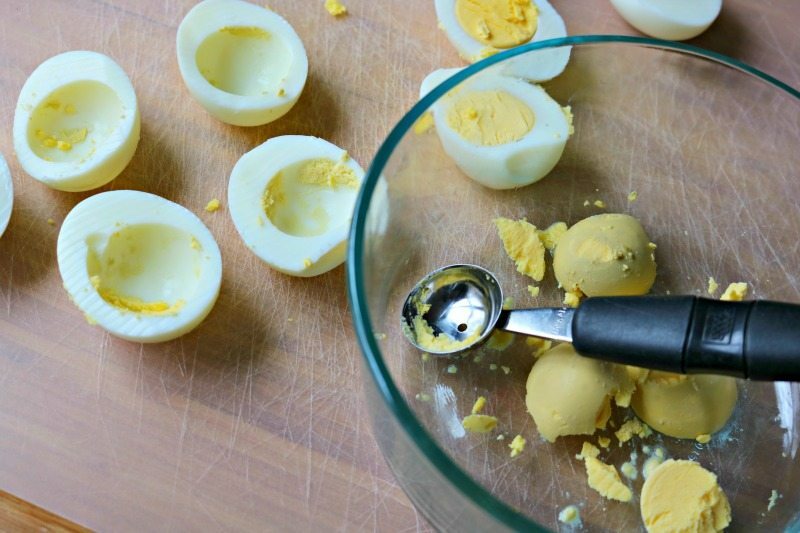 Slice open eggs and scoop out the yolk into a large bowl. I find a melon baller a very helpful tool for this process. 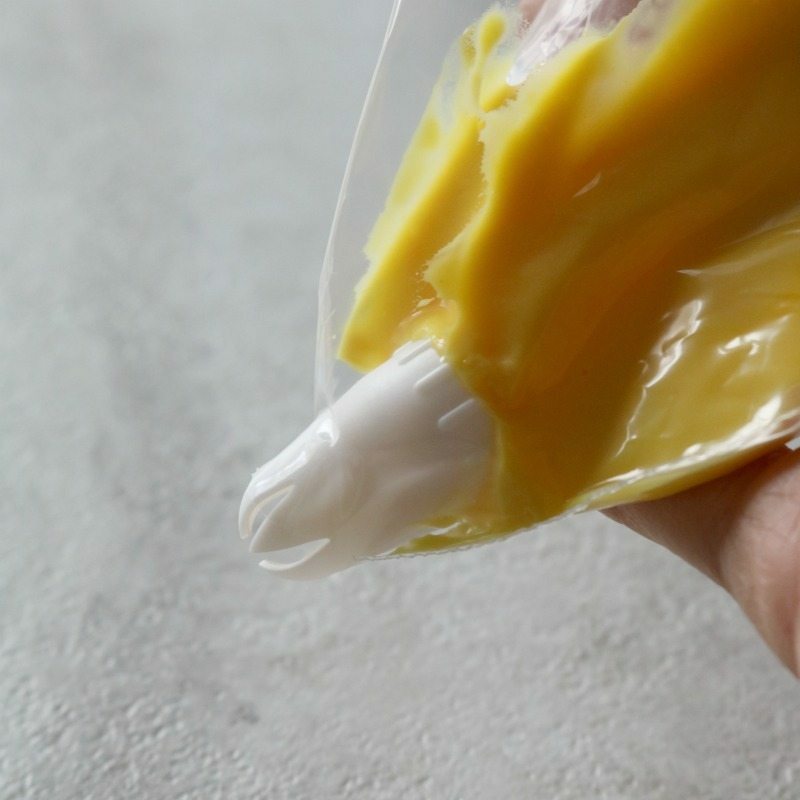 Mix together egg yolks with mayonnaise, yogurt, mustard and seasonings until smooth. Take out 2 tablespoons of deviled egg filling and set aside. Add 3-4 drops natural green food coloring to the remaining egg filling. 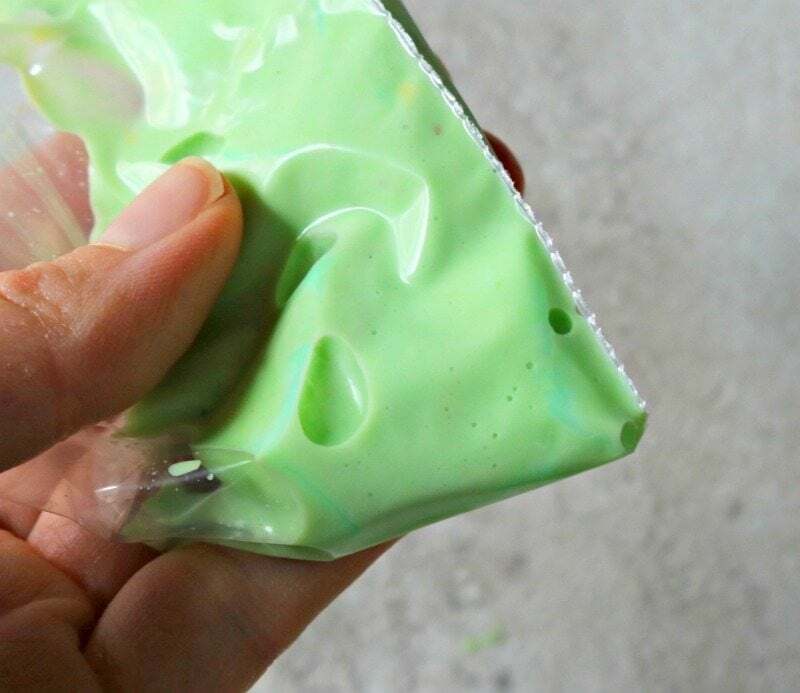 Place the green filling into a sandwich bag and cut a corner off the side –or use a piping bag fitted with medium circle. Fill the egg white cavity with the green filling. Once the cavity is filled, go back and forth over the egg to create a triangle shape that will become the Christmas tree. Place the reserved yellow mixture into a piping bag fitted with a star tip , or plastic bag fitted with star tip, and add squeeze on the top of each tree, to create the star. To make ornaments, dollop out little dots of sriracha sauce. And for the base of the tree, use a half a kalamata olive as the trunk. And there you have your Christmas Tree Deviled egg–a fun addition to any party. Peel eggs and cut in half. Scoop out the yolks and add to a mixing bowl. Add in the yogurt, mayo, mustard, onion powder, garlic powder and salt. Beat until smooth and creamy. Set aside 2 tablespoons of the mixture for stars. Dye the remaining filling green. Place the green filling into a piping bag and pipe the filling into the cavity of the egg and then make a Triangle shape on the top of the egg, by moving your piping bag slowly side to side--to make it look like branches. Dollop each tree with a yellow star, by using a piping bag fitted with a star attachment. Dot sriracha over the tree for ornaments and finish with an olive half for the base of the tree. When ready to serve, add ornaments and base of tree. These look amazing, my family loves deviled eggs! I can add them to the Christmas table now! 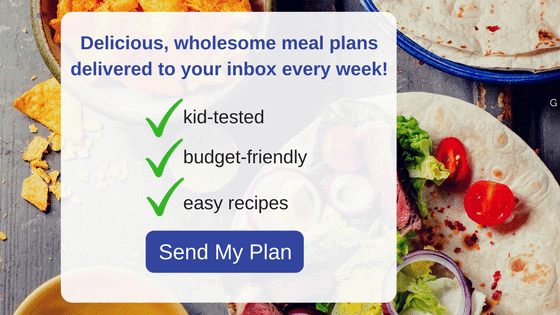 Yes, your family will love this addition! 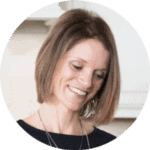 Kristen – these deviled eggs are genius! I gotta admit, I looked at the picture a fraction of a second before I read the title and did think – wow – what a delicious looking cookie – but, when I saw the title, I was more in awe! These Chrsitmas tree deviled eggs are a first for me! When you mentioned natural food coloring I did think that you used spinach – but glad you kept your family happy and didn’t 🙂 These are a masterpiece! LOL! Do you know how many people have asked me if they were cookies? I love that this fools people. And I am SO stocked for the natural food colorings. Colored cookies here we come. This could get dangerous!! Hi Kristen – these are adorable. You are so clever. I love the sriracha sauce for the ornaments. Love this for the holidays! OMG!! THESE are so insanely creative and adorable and I would totally eat 15 million, ha ha! I just found your recipe because I couldn’t read the Christmas Tree Deviled Eggs recipe printed on my Farmhouse Eggs carton and I was hoping they’d posted the recipe on their website. I was googling “Christmas Tree Deviled Eggs” and your site came up. Imagine my surprise! Your ingredients and theirs are the exact same. I’m so glad because they didn’t have the recipe posted on their website and with my eyesight I couldn’t read all of it off the carton. Thanks!